Acana Wild Prairie is a cereal free complete food for adult cats and kittens alike, designed to be biologically appropriate and fulfil your feline friend’s naturally carnivorous cravings. Made with 75% meat, including naturally protein dense cage-free chicken and turkey,wild caught fish, nest laid eggs, and nutritionally balanced quantities of fruits, berries, and grasses. 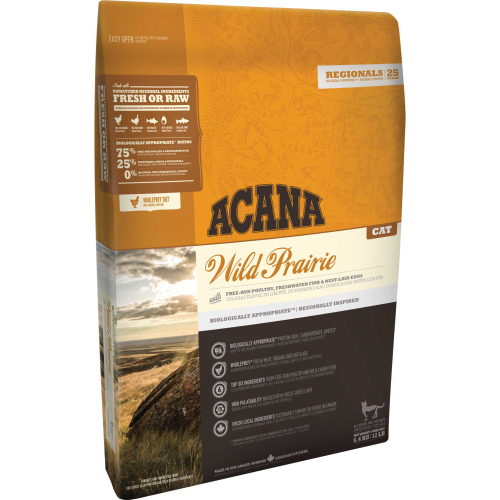 Containing vegetables such as butternut squash and pumpkin as low glycemic index sources of carbohydrates, Acana Wild Prairie is free from preservatives and prepared from fresh ingredients to provide your furry friend with all the essential proteins and fats they require to thrive. Crude protein (min.) 37 %, Crude fat (min.) 20 %, Crude ash (max.) 7 %, Crude fibres (max.) 3 %, Moisture (max.) 10 %, Calcium (min.) 1.5 % Phosphorus (min.) 1.1 %, Magnesium (max.) 0.1 %, Taurine (min.) 0.15 %, Omega-6 fatty acids (min.) 2.9 %, Omega-3 fatty acids (min.) 0.9 %, DHA (min.) 0.2 %, EPA (min.) 0.2 %.